WARLORD UK, an "old-school" death metal band from Birmingham, England, has reformed with Mark White on bass/vocals and Neil Farrington on drums, along with two new members — guitarists Matt Nennan and Matt Draycott. White says, "We are busy back in the studio getting ready for gigs in the UK and Germany in 2009." 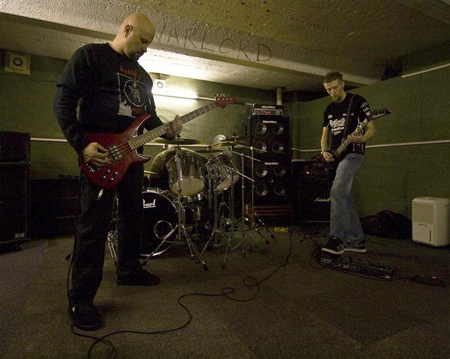 Formed in 1992, the original lineup of WARLORD UK consisted of Mark White (bass, vocals), Andrew "Bear" Stone (guitar), Michael Gorst (guitar), and a drum machine. They eventually recruited a human drummer, Neil Hutton, later replaced by Neil Farrington. The band recorded one album for Nuclear Blast, "Maximum Carnage" (1996), which featured Dave Ingram (BENEDICTION, BOLT THROWER) on vocals. For more information, visit www.myspace.com/warlordukmetal.